Two homegrown businesses share tips on how Facebook ads can work to your advantage. New business or small, medium, enterprise owners may not have it in their budget to hire a social media manager yet. Most of them would prefer to run their own Facebook pages and advertisements by themselves. 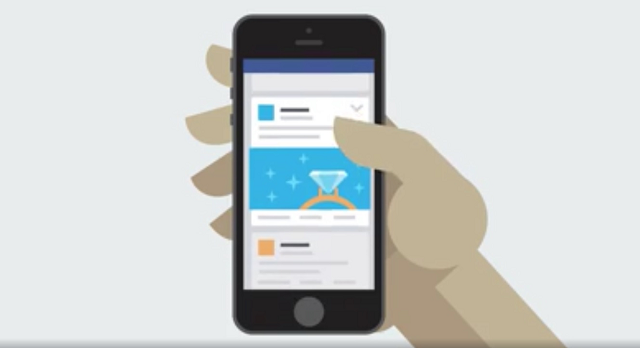 After all, Facebook made it fairly easy for people to boost a page post or run their own advertisements. There’s a walkthrough or a step-by-step guide and a Help Page also exists for those people encountering a problem. When the time comes to finally run your own Facebook ad, however, it is easier said than done. Thus, here are some of their tips so you can make the most of running your first Facebook advertisement. For Greg Ballesteros Rivera, owner of startup EntrepZone, it would be imperative that you know the personality of your brand. This should come out when you craft your message or copies when creating the advertisement. If you are a fun and youthful brand, then that should show in the advertisement. Use light and bright visuals and the text has to be upbeat. However, if you are a B2B (business to business) provider, your tone has to be serious and trustworthy. Doing it your own way and showing the unique personality of your brand is also a way to stand out from the rest of the FB advertisements that social media users see every day, he said. Rivera’s business concept is fairly new to his audience. EntrepZone is a marketplace for business owners who can buy or sell their business. Introducing a new product may be the hardest thing to achieve in advertisements. You have to earn the trust of the people first. This is why he has to make his message as clear as possible when he communicates via the ads. “Imagine yourself saying it out loud in person,” he said. Use simple sentences and include your value proposition right away, he added. 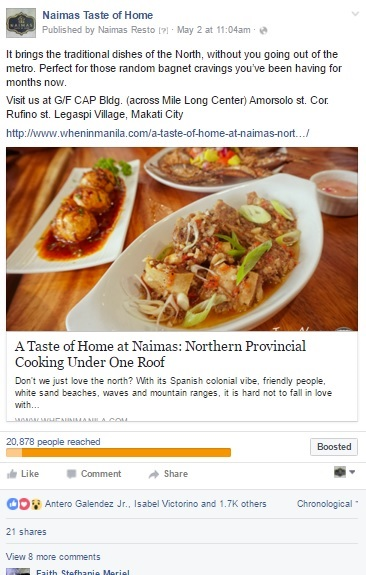 For Tricia Alonte, whose family co-owns the Makati restaurant Naimas Taste of Home, posting enticing photos of their food is one of the main drivers of their successful Facebook campaigns. She and her family were delighted to see that their Facebook ad has reach a wide variety of customers. This has led to an increase in sales, especially when they started posting their new features or specials. This is mainly due to the quality of the food photos they are posting. She emphasized that you only need a few seconds to capture the attention of prospect clients or patrons so including visuals or photos is very important. It is time to remove that shyness and ask help from your friends, suggested Rivera. Need some help with photos? Do you need a quick check on the copies? Time to tap your closest resources—your talented friends. Of course, this may also come with a cost but doing it with people you trust will give you that confidence boost to finally run your ad. 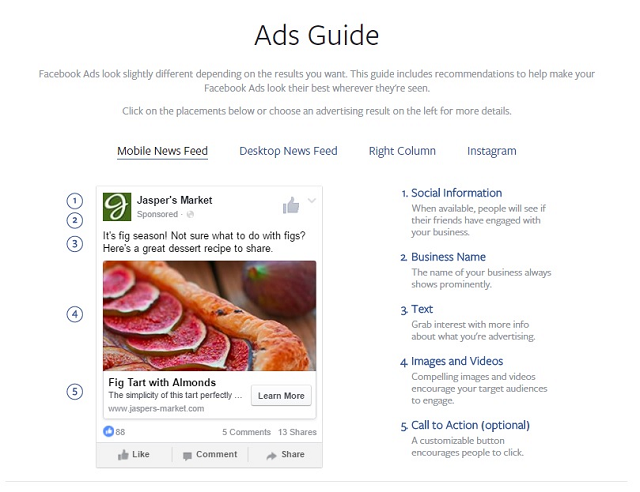 To optimize your ad and maximize its potential, Facebook gives you several options to personalize it. Take advantage of this, they suggested. This includes what time it is going to be shown, the age range of people who are going to see it, and even the gender. For a restaurant, it would be best to run it by lunch or dinner time when people are searching for options where to eat. For a B2B type of business, you may need to filter the audience by age because decision makers of companies are less likely to be children and teenagers. After you run your ad, is that it? Of course not, said Alonte. Personally monitoring the statistics of the ad via Facebook insight is a great way to learn, she said. “We get to know the type of people who engage with our ad and our page. From that, we learn how to make a better advertisement the next time,” she said.